Look for codes on participating Smithfield bacon variety packages and go to www.smithfield.com/baconforlife for a chance to win the Smithfield Bacon for Life Sweepstakes. 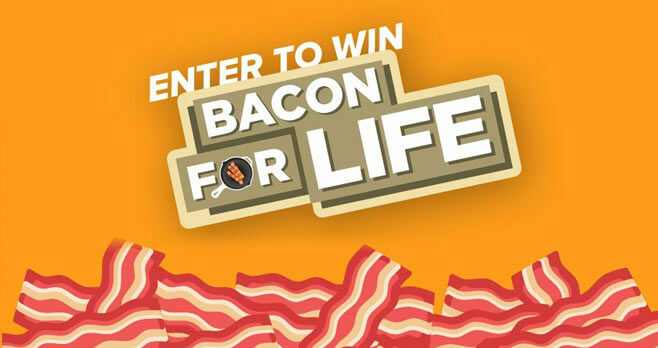 You could win Bacon For Life, Bacon for a Year, a custom “Bacon Bicycle”, and other prizes. Eligibility: The Smithfield Bacon for Life Sweepstakes is open to legal residents of the 50 United States and the District of Columbia and who are at least 18 years old at the time of entry. Promotion Period: The Sweepstakes begins on September 1, 2018 at 12:00 a.m. ET and ends on December 31, 2018 11:59 p.m. ET. Limit: Each entrant may submit up to a maximum total of 100 entries by any method or combination of methods of entry. Prize(s): The grand prize consists of “Bacon for Life,” calculated as one (1) package of bacon per week for up to 50 years. Prize to be fulfilled as follows: first five (5) years awarded as 260 coupons with a value of up to $7.99 each and the remaining 45 years of the prize amount will be distributed via a cash gift card that may be used to purchase Smithfield products at a local distribution channel. Gift card will hold a value of $18,700. Approximate Retail Value of Grand Prize: $20,777.